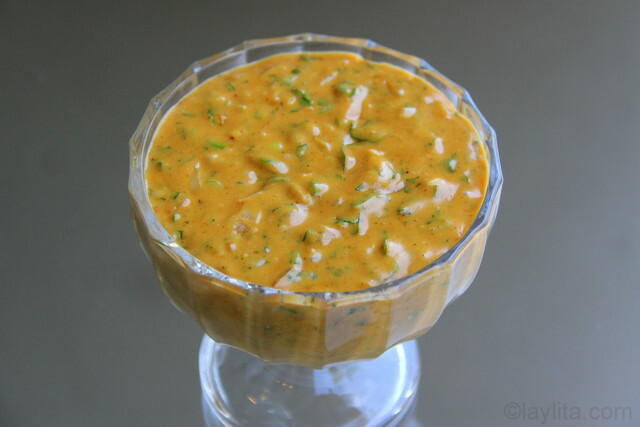 Salsa de mani is a savory warm peanut sauce made with peanut butter, milk, onion, cumin, achiote, cilantro and hard-boiled egg. 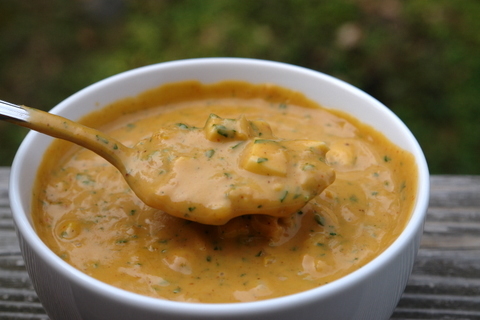 In Ecuador, this delicious peanut sauce is a must-have topping sauce for Ecuadorian llapingachos or potato patties. It’s also very good on top of boiled yuca or cassava, boiled potatoes, as well as with other vegetables and meats. 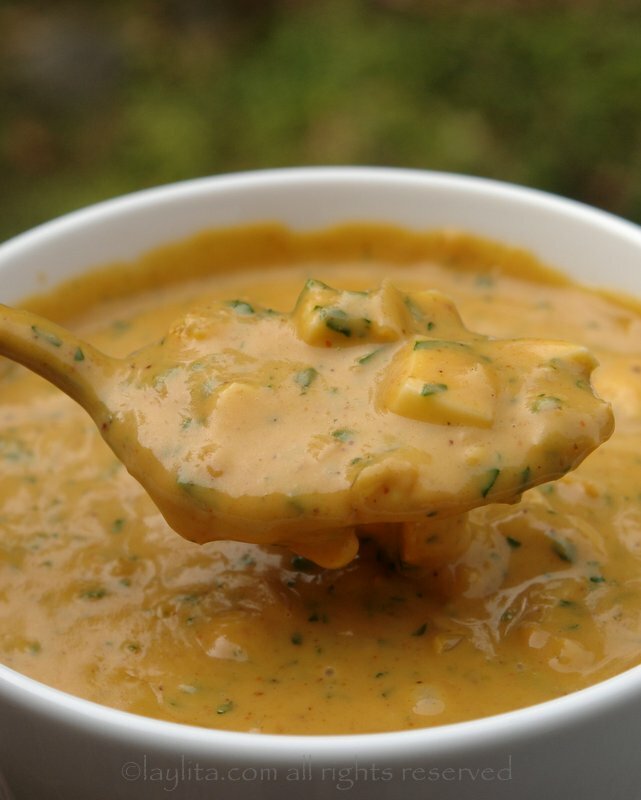 My dad used to cut the boiled yuca or potatoes into small pieces, add this peanut sauce and cook it for a few minutes until warm – add some crumbled quesillo or queso fresco and it was delicious. I also recommend trying this sauce with llapingachos de mote or hominy corn patties stuffed with cheese or pork. 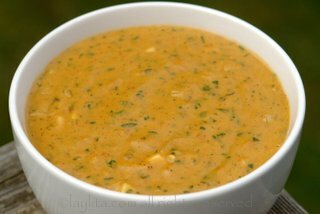 This peanut sauce is traditionally made with fresh roasted peanuts instead of store bough peanut butter, but this is my quick and easy version of salsa de mani. This sauce sometimes has chopped hard boiled egg pieces, but it is optional and can left out. 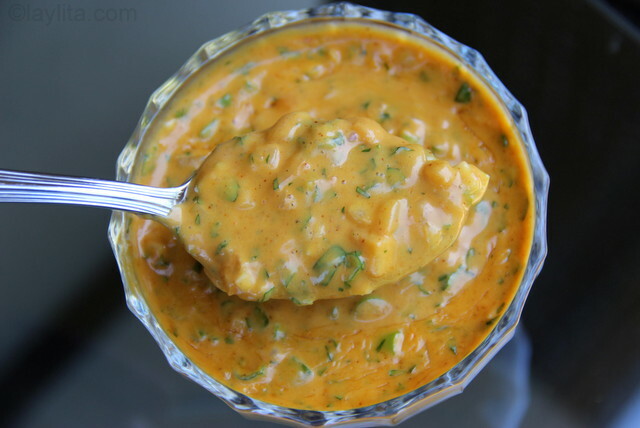 Also, for a spicy version of this peanut sauce, you can add finely chopped hot peppers or some ground chili powder. 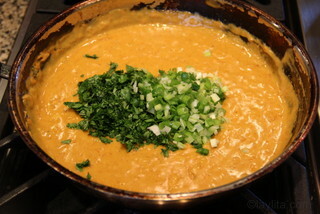 Salsa de mani is a warm peanut sauce made with peanut butter, milk, onion, cumin, achiote, cilantro and hard-boiled egg. Mix the peanut butter with ½ cup of milk to help dissolve the peanut butter. Heat the butter or oil to prepare a refrito, add the onion, achiote, cumin and salt, cook until the onions are soft. Add the peanut butter and milk mixture, as well the remaining ½ cup of milk. Stir well and simmer for about 10 minutes. Add the chopped hard-boiled egg, cilantro, aji (if using) and onions. In 2010 I spend 40 days in Ecuador, and for 3 weeks I lived with a amazing family in a small village near Quito (Oyambarillo). I think this just might be the sauce my ”ecuadorian mom” served on my potatoes as a side dish to her cuy (or at least a version of her peanut sauce). Laylita, thank you! My grandfather is from Quito and my grandmother is from Chile, and this recipe took me right back to their house when I was little! I made these to go with your llapingachos (also extremely delicious). My grandmother used to make this sauce to go with big boiled potatoes, roast chicken, and fried yuca and it was amazing. I just discovered your website, and it looks fantastic. Thanks for all of this! Hi, I cant seem to find unsweetened peanut butter. Can you please recommend an alternative? 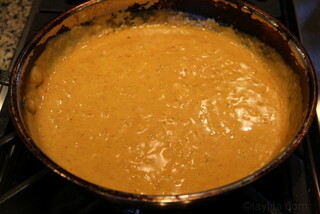 If you can find whole peanuts (peeled) then use those, roast them and then blend them with milk to make the sauce. I was looking for this sauce! My boyfriend is from Quito , I am from Lima – Peru. I mostly cook peruvian food (he loves it) but from time to time he ask me for some ecuadorian dishes , I will use your recepies , they look fun and easy to make ! Thank you so much! PS: My favorite ecuadorian dish is encebollado!!!!! Queda marcada tu pagina en una de mis favoritas. Yo vivo en Santa Rosa, California. Naci en Cuenca, Ecuador y mis experiencias de nina y jovencita fueron muy similares a las tuyas. Aunque parte de mi ninez si fue en Quito los helados de la tienda de la esquina son recuerdos imborrables. Hey! I just made this! Had it with Curtido de cebolla! I have a feeling this recipe, combined with your plantain puree, is the secret to my FAVORITE Cazuela de Camaron. Shrimp Casserole. I ALWAYS have it at the Ecuadorian restaurant I frequent and am DYING to figure it out so I can make it for myself. Unless you have a different recipe? The main difference is that plantain puree for the cazuela uses green plantains, but besides that if you combine the ingredients for the peanut sauce and the puree it is very close to a cazuela. Though I think a variation of the cazuela with sweet plantains would also be very good! I just back from Ecuador and spent a several days at the beach eating so many different dishes made with plantains: cazuela, sango, tigrillo, bolllos de pescado, corviche, bolones, tortillas de verde…I will try to post the recipes soon! Hi Elizabeth, I don’t think that the sauce can be frozen, peanut butter doesn’t freeze well. Sorry. Hi! I just made this sauce and there was a lot left over. I was just wondering if I could freeze it.